I’m the kind of person who likes to get ready and get out the door quickly. Unfortunately, when you have long hair, you have to spend time drying it (or just leave the house with wet hair…which I do way more than I should.) Blow drying hair just seems to take so LONG. When I go to the stylist, they’re able to use those cool round brushes and roll, roll, dry, done! How do they do that? Well now, I can finally achieve that “just blown dry by a stylist” look with the Infiniti Pro by Conair™ Spin Air Brush. Want to put a new spin on your hair styling routine? Smooth, frizz-free and voluminous hair is now easy to achieve with the new Infiniti Pro by Conair™ Spin Air Brush! Shaped like a typical round hair brush you’d use to do a blow-out, the Spin Air brush combines two tools in one by blowing air through the rotating brush to volumize and add shine as you dry. To me, the Conair Spin Air Brush is a genius product that should’ve been invented many, many years ago. For someone who isn’t used to blow-drying hair, handling a round brush and a blow dryer to style hair isn’t that easy. 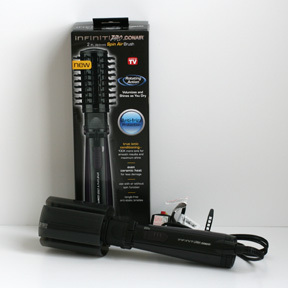 Finally, here’s a product that combines both essential hair-styling tools into one, easy to manage product. Before I started using the Conair Spin Air Brush, I made sure to watch one of their tutorial videos (shown below.) It looks simple enough – divide your hair into sections, then spin, letting the spin-action and the blow dryer do all the work. The model made it looks super easy and her hair was smashing by the end of the video. I just happened to have a damp head of hair that was optimal for testing the Conair Spin Air Brush. I sectioned off my hair and started drying. There are two buttons at the top of the brush that control the direction of the spinning. One button goes away from you, the other towards you. There are also three heat settings on the brush, Hot, Warm, and Cool. I made sure the brush was spinning away from me and was on the hot setting. I put it at the ends of one section of the hair and started spinning. And it worked just like the video! I spun for a few seconds at the root, then let the whole thing spin to the top of my head. After several seconds, I used my thumb to move the setting down to “cool” to help the roundness set, then pulled out the brush. The result – one section of dry and shiny hair, with a slight curl at the tips. After using the brush, I do have a couple of tips. 1) When you section your hair, make sure you have nice clean sections, otherwise the brush could spin up other sections of your hair. 2) Be aware that the brush won’t spin when it’s set to “Cool”. (Which makes sense since you’re cooling to set the style.) 3) If you’re nervous about the spinning, practice for a few seconds on just the roots so you can get used to the speed and handling the brush as it’s spinning through your hair. The Conair Spin Air Brush cut my hair drying time down significantly and my overall styling time down even more since it is styling at the same time it’s drying. It’s an all-in-one product that brushes, dries, and styles my hair all at the same time! It is the only tool I will be using to try dry my hair. 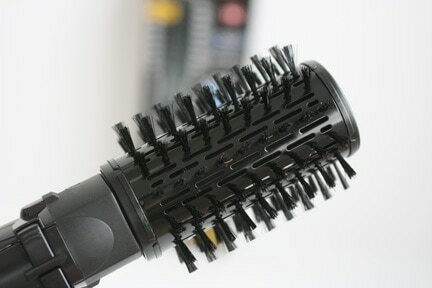 If you want to make your hair-styling time much, much easier, check out the Conair Spin Air Brush. It’s available nationwide for $59.99 as well as online at www.conairspinair.com or Amazon.com for $47.99. One winner will receive a Conair Spin Air Brush! This giveaway ended on October 21, 2011 and is now closed. I “Like” Conair on Facebook. I follow Conair on Twitter. My best hairstyling trick is to wash my hair at night, It tends to behave better! I followed Conair on twitter! Subscribed to the WiC Project via e-mail! lucky for the rest, I can’t use this on my curly hair–or am unwilling–so I’m not competition for the contest. Looks like a great product, though. I like to use a straighter defrizz product after straightening my hair to reduce the frizz! shoot hair with cold air after blow drying. I put in rollers, then put on a heat finisher, then blow dry with heat…then cool air. The curls stay in a long time! I have coarse thick hair so it takes a long time to dry my hair and then to straighten it! i let it air dry half way then put in silk drops and then blow dry it. it makes it so much easier and less frizzy! Root boosting spray before you blowdry can give you a ton of added volume! Subscribed to the google RSS feed! I subscribe to WIC Project via email. less is more is my beauty styling trip! My tip is not to overuse conditioner. I try to keep conditioner away from my roots, seems to keep hair from looking greasy. I always wash my hair in the morning and always groom it the same way. I got my tip from watching hairstylist Nick Chavez on TV – bend my head down & let my long hair fall down in front of me, then spray hair with voluminizing spray, work through hair with fingers, then flip hair back. It gets more volume and looks nicer. I use coconut oil as a hair moisturizer. One of my tricks is hair should be washed before any styling! I then use moisturizer (Luster’s pink I love it) just a bit, it prevents curls from being to fuzzy and adds LOTS OF SHINE! I either do rolls and air dry/blow dry or for slight air curve, just do ponytail, roll into rosette and wear for 2 hours, or while do some housework- voila the easiest styling, I take it off and let my hair down- no need for rolls and a lot of time! I’m not very talented when it comes to styling my hair…I really need all the help I can get! 🙂 My best styling trick is to use a good heat protector and a quality flat iron to get a nice smooth look! My best tip is to start with a good shampoo and conditioner. I shake my hair with a towel upside down and squish it with the towel to partial dry it before I use the blow dryer. My best hair styling tip is that I blow dry my hair upside down. I find it gives my hair a lot more body. I am a fan of Conair on Facebook. I am following Conair on Twitter. I am subscribed to follow your RSS Feeds with my Google Reader ([email protected]). I am subscribed to receive your emails using [email protected]. If I had a hair styling trick I wouldn’t need this. Sorry, I have no tricks. Best styling trick… I guess would be to keep your hair cut regularly and conditioned, so minimal damage occurs. I really don’t have a trick but I do know how to do a topsy tail (memba that?!) without the actual wand tool thingy. Brush your hair in the shower when it has conditioner on it – easiest way to get out tangles! following The WiC Project on Google Friend Connect. subscriber of The WiC Project via google reader. I only gel and curl my hair but it works! My favorite hairstyling trick is to use a wide tooth comb in the shower while the conditioner is working. This works great for me because my hair is super unmanageable and this makes it easier to brush when I am ready too! This product looks amazing, it would save me sooo much time! I “Liked” Conair on Facebook. I“Liked” The WiC Project on Facebook. My hairstyling trick is that I always spray heat protection before using any kind of curling iron or flat iron. Keeps my hair from drying out! to tame flyaways I use a dab of olive oil on my ends..
For the perfect bump, forget bump-it product. If you have the right comb and hairspray with some teasing you can get the perfect natural bump! if you follow Conair on Twitter. My tip is to use a heat protective spray when using a flat iron or blow dryer. I put a sealant on my hair after I have flat ironed it. During the summer I let my hair half air dry and then I finish up with the hair dryer. A great tip is to get a towel hair wrap. It will absorb the excess moisture from your hair so it’s not too damp when you go to blow dry it. What works best for me is getting a REALLY good shampoo & conditioner suited to your own hair type! When I’m somewhere with no hair dryer, I sit in front of a small fan to dry my hair – and it works, especially if you turn a few times! I follow you on GFC, subscribe to your email and like you on Facebook! I would love to win this! My tip is to always use hair polisher! It really helps! Thanks so much for the fantastic giveaway! my trick is to dry as soon as possible and use a round brush and mousse. Cheap olive oil makes a great leave-in conditioner – adds shine. My best trick is to deep condition once a week. Following Conair via Twitter (@Hotsnotty2), Thanks! I love the air brushes, I will wash my hair at night bun it then air brush in the morning, super fast and less damage. I blow dry my hair upside down to add more volume. Thanks for the giveaway. You can get a curly set and avoid the hot air of a dryer by using soft rollers on your head overnight. Just make sure your hair is just damp when you use the rollers. I use a frizz control product on wet hair to keep the fly aways down. I liked ConAir on Facebook. I like the WicProject on Facebook. I am now following Conair on Twitter (name TarriC). I am following the WiC Project on Twitter (name TarriC). I follow the WiC Project on GFC. I follow the WiC Project via reader (my AOL). I follow the WiC Project via email. I always use a quality heat protective spray before styling or blow drying. I blow dry with my head upside down to add volume – it really works! For me, I just brush it back and go with it. I always finish conditioner in my hair by washing it out with cool water. Gives a great shine! I use an anti frizz lotion before drying or ironing my hair. I like Conair on Facebook. My best trick is to use cooler water on my hair when washing it to prevent it from drying out. My best hair styling trick is washing with clarifying shampoo and baking soda together, they clean your hair and scalp really good. I’m a Conair follower on Twitter (MsTylerpants). Every three-four months, mix a teaspoon full of baking soda and a teaspoon full of shampoo together (mix very well) and vigorously massage into hair to remove hairspray build-up. Moisturize with a high quality conditioner immediately afterwards. I like Conair on FB (Sarah Smile). If you are out and you start to get a lot of fly away hair – put hand lotion on and then smooth your hands over your hair. Helps a lot. +1 “Like” Conair on Facebook. I love straightening my hair. I don’t know many other tricks yet! I like Conair on FB. Samantha M.
My hair does best when I wash it, brush it and let it air dry…I don’t do products very much. If you flip your hair over your head while blow drying your hair, it’s much fuller and dries much quicker. +1 “Like” The WiC Project on Facebook. I find if I want my styling to stay in place, it is better to style hair that was washed before instead of newly clean. I like your blog on fb as kerrie mayans. My best trick is to use aloe vera as hair gel, good for your hair and scalp and works just as good. I like WIC project of fb. My best trick it to wrap my hair up in a pony tail! My best styling trick actually starts before styling. When I get out of the shower I use Garnier Fructis Sleek & Shine balm. It really helps control flyaways and adds some shine. I let my hair dry about 80 percent before I put on styling creme and blow dry my hair. My hair stays healthier and looks better from less heat. I follow Conair on Twitter @angevege. USE ROOT PUMP!!! it really works! I have natural curly hair which I hate and I love straightening my hair with a flat iron it leaves my hair soft and shiny and easy to manage. Already “Like” Conair on Facebook. already subscribed to the mailing list of The WiC Project – Faith. Free Giveaways. Product Reviews. Recipes. Already follow The WiC Project on Google Friend Connect. I liked the WIC Project on FB. I have thin hair so I use a hair follicle thickener after washing my hair, then put my hair upside down and scrunch it until it poofs up. I apply a small amount of smoothing product on my damp hair before blow drying it to help control my frizzy hair. Following Conair on twitter as @KandiKlbs1. Confirmed email subscriber using above email address. For a longer hold when you style with a curling iron try spraying hairspray before curling hair.